Time on my hand, I thought I would dig around a bit and try to find a few forgotten songs for Halloween. And I found a few! Here are 8 really scary Halloween songs from the classic rock band...Chicago. From their latest album - "Chicago 666," of course. "(I've Been) Searchin' So Long (to find an ax-sharpener)"
"25 or 6 to Life"
"Just You 'n' Me and Plastic Wrap"
"Does Anybody Really Know What Crime It Is?" 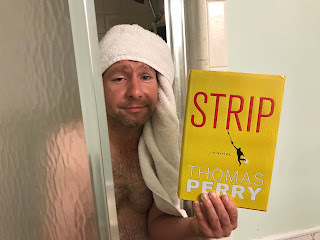 This Thomas Perry novel was just a late summer toss read. Nothing deep. A story to chew on while waiting for the leaves of autumn to begin changing their clothes. Just a quick in-and-out. The story revolves around an aging mob boss who learns his strip clubs are getting robbed and the new guy in town he mistakenly fingers for the job. A guy who just wants to eat his sandwich in peace. A guy you shouldn't poke with a stick. There are a few other characters thrown into the mix, each of variable shades of badness and stupid, and to be honest, I found these misfits a lot more interesting. However, Perry does write some pretty good parlay betwixt them all and throws in a good twist or two to twerk the story along. But at the end of the day, it was really hard to find someone to toss my keys to and drive. Plus, the story took a couple of louies where I would've preferred the writer feint in another direction. But that one, my friends, is on me. So what does this all mean? It means I wasn't too much concerned about who came out on top. Still, the pages turn fast and though "Strip" didn't quite hit the proverbial sweet spot, it was entertaining enough that I didn't regret it. Simon & Garfunkel thing for a couple of years." Names can be hard to remember, but a face one never forgets. 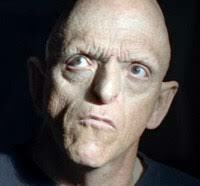 Michael Berryman gives good face. And he knows it. He has appeared in over 100 films and television ranging from cult horror frights and Oscar-winning dramas to even adding a touch of strange to Eminem videos. Michael Berryman is one of a handful of actors that always give the audience a delight simply by letting the camera catch his beautifully different, wonderfully unique features. For over 40 years, Michael Berryman has been thrilling audiences on the screen with his evil, insane ways. So synonymous has he become with the horror genre, that Berryman is often asked to cameo simply tongue-in-cheek! It works either way. Audiences love him. 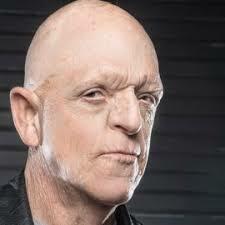 As I said, Michael Berryman gives good face. Go get you some. Casey Chambers: Early in your career, you found yourself cast in the hugely successful film, "One Flew Over The Cuckoo's Nest." (1975) As a young actor just starting out in the business, what were some of the things you learned while making that film? Michael Berryman: When I went to work for George Pal, I did my first movie, "Doc Savage: The Man Of Bronze." (1975) George gave me a guarantee on my contract for two days. That was important because that allowed me to join the Screen Actors Guild. When you're working on a union project, day one you're allowed to work without being a member of the union. But on day two, you have to join the union. Anyway, I wound up flying to Salem, Oregon and we had two weeks of rehearsals at the Oregon State Hospital. Six days a week. It was the actual hospital. We'd spend about an hour of each day with real patients to get the gist of what it was like to be in there. And we went over the blocking with the cameras for all the major scenes and there was a lot of rehearsals. It was absolutely monumental. It had such a profound effect on me. I had no speaking lines, but I got to learn a lot about making films. I asked our director Milos (Forman), 'What do I need to know to be an asset to this production?' He actually placed me in front of a Panavision camera and he said...while puffing on his pipe which he always had (laughs)...he said, 'I want you to look at the lens.' So I'm standing in front of the lens and he says, 'I want you to have a love affair with the glass.' And I never forgot that. A couple of days later, the cinematographer handed me a book on cinematography. And every chance I had, I'd ask questions. I'd look through the cameras and learn what the dials do, and all various other things. It helped me tremendously down the line. Understanding how the camera works and how a film actor should understand what it is they're trying to capture. Between close-ups, wide shots, panning, etc. I was pretty young, and here I was with Jack Nicholson and Michael Douglas and all these other people who had been doing this for a long time. I learned a lot. I was there for 127 days. Casey Chambers: Were you familiar with Ken Kesey's novel at the time? 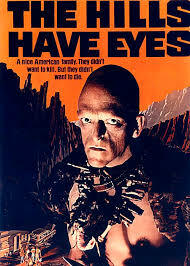 Michael Berryman: Oh yes, and I have read the book numerous times. Actually, before I left for Oregon, I attended a theatrical performance at the Pasadena Playhouse in Pasadena, California. Chief Bromden was being portrayed by Woody Strode. And William Devane was playing McMurphy. Casey Chambers: Oh, how cool. 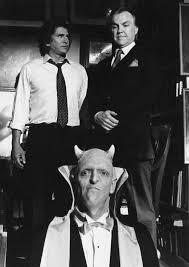 Michael Berryman: Yeah, and the stage production was very interesting, too, because they kept the story in Ken Kesey's vision. The room would be very dark and they would project on the back screen behind the actors, the hallucinations that the Chief would have...with a voiceover commentary. I heard from Michael that his father, Kirk Douglas, had been trying for years to get the film made, but nobody wanted to do a film that dealt with mental illness. Another problem was Kesey's screenplay being like, 300 pages long. It was not structured in a manner where you could shoot the script for a movie. And he was also very upset that the movie was going to be shot through Jack Nicholson's character and not from the perspective of the big Chief. So they eventually, I guess, bought him out and bought the rights to make the film. Casey Chambers: The casting was perfect. The movie went on to win five major Oscars. And you got to share in a tasty slice of film history pie. How cool is that! And then right after that, you scored another coup by starring in the Wes Craven cult classic..."The Hills Have Eyes." (1977) And even 40 years later, the movie still has bite. When did you first hook up with Wes Craven? That was the first movie you made with him, right? We didn't have a big budget. I think we had a little mini Winnebago, and then we had a trailer and a station wagon. And everybody drove their own cars out to the hotel. Then we'd all just drive out to the middle of nowhere and start rolling film. I think we were filming in Super 16. Casey Chambers: Completely different environment, no doubt. Michael Berryman: Oh yeah. Well, it was funny. The 'Hill family'...which was me, Mars, Ruby, and Jimmy Whitworth...we were kind of enjoying the rough and tumble grittiness of it all. But then the 'Whitebread family' as I called them (laughs)...which was Suze Lanier and Dee Wallace and Bobby and the rest...they were all L.A. people. They did a lot of television. They hadn't done a lot of features that I can recall and so there really did become two different camps so to speak. And so when they would complain and moan about how they were getting all dirty and whatever, we would mess with them. Somewhat in character. (laughs) It was interesting to watch the transformation which was part of the theme of Wes' writing. That in the right circumstances, the quote "civilized person" can become savage and revert to survival mode. It was a pretty valid concept. Michael Berryman: (laughs) There's just certain things like that that are just kind of fun. Another one of my favorite scenes is when Grandpa Fred is talking to Big Bob and he goes, 'so I took a tire iron and split his face wide open.' And Big Bob goes, 'Well, how bad was it?' Well, that scene just makes me laugh and I told Wes...I said, 'You might want to change that. It sets it up for a laugh instead of being terrifying.' And Wes says, 'Well, wait a minute. What happens next?' And I go, 'Oh yeah! Yeah, that kind of sets you up for the smash through the window.' And it really is a great pullback when he gets attacked by Papa Jupiter. And they overcrank the film so it plays very dreamy. There's almost no blood and guts. But it's a terrifying movie. It really holds up. 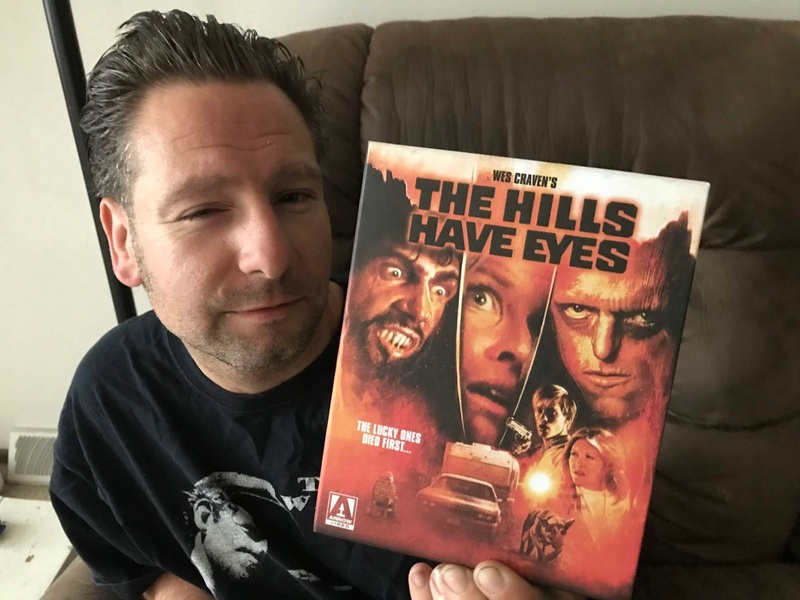 Casey Chambers: "The Hills Have Eyes" is a lot of fun. Now you've also appeared in numerous TV shows. So I'm gonna cherrypick one that I especially enjoyed while I was growing up. You were surprisingly in a couple of my favorite episodes of "Highway To Heaven." So I had studied, studied, studied. I knew everybody's lines. And I'm doing this scene with Anthony Zerbe and Michael Landon and Victor French. And in my head, I'm saying to myself, 'okay Michael's going to say this. You say that. And then Victor will say this. Zerbe will say that.' And I'm timing my delivery. Waiting my turn. And then my mind went blank. (laughs) And Michael waited about five seconds, and he could tell that, y'know ...oops! And he goes, 'Cut!' And the second he said 'cut,' the script lady had this big script book in front of my face with a ruler underneath my first line. And when she presented it to me, she said the prefatory line. The line before my first speak. And I go, 'Oh yeah, that's it.' She looked at me and I go, 'I'm good.' Michael looked at me and says, 'We good?' I said, 'I'm good.' Michael says, 'Okay. Going again. Action!' And bingo! I nailed it. Michael says, 'Okay, moving on.' And we all moved on to the next take. Now, I'll go back in time a little bit to when he actually made a movie of the week. ("The Loneliest Runner" - 1976) It portrayed his childhood, which was pretty darn...some people would say embarrassing or very revealing. He was a bedwetter. And he was a long distance runner. That was his way to cope with his embarrassment or whatever issues that he had in his head. When you're a long distance runner...and I ran cross-country in high school and college...you get these endorphins. And when you're running, your mind and your body eventually come together and you kind of find a tranquil space. So that was pretty interesting to me. But Michael became a long distance runner so he could run from school to his home before the school bus arrived and remove the sheets that his mother would hang out in front of the house to let the whole neighborhood know that she was upset. Instead of just drying them in the dryer, she would do that to embarrass him. That's actually a true story. So we shared a lot. And that's kind of my trip around the block in regards to Michael Landon. Miss you brother. God bless you. What a wonderful, wonderful guy. Casey Chambers: I'm a Landon fan, too. And that's a great story. We talk a lot about music here at The College Crowd Digs Me. What kind of music trips your flip? Any favorite bands or songwriters? Michael Berryman: Oh absolutely. See, I graduated from high school in 1966. I was at The Troubador which is a very famous club in Los Angeles, and I had a friend that played really great guitar. A Martin guitar. Well I couldn't play instruments too well, my fingers are kind of messed up, but I could sing well and I write good lyrics. We did a kind of Simon & Garfunkel thing for a couple of years. Just local. Never went anywhere. But...we went to a lot of great concerts. So one afternoon, I caught wind that Joni Mitchell was doing the soundcheck at The Troubador. So we hopped on the blue bus...the Santa Monica bus...and went up Santa Monica Boulevard. Michael Berryman: Yeah! (laughs) And we caught her doing the soundcheck. Of course, we knew every one of her songs. We got to talk to her. She was super nice. I think she's one of the goddesses of the "Ladies of the Canyon," so to speak. Okay, I'll just go through the list. Joni Mitchell. Crosby Stills and Nash. Graham Nash, who is still playing by the way and some of his new albums are just remarkable. Buffy Saint-Marie. The Byrds. Eric Burdon and The Animals. Stephen Stills is just tremendous. I also like Judy Collins. Oh gosh, there's just so many. The Hollies. So many artists from the '60s and '70s...they would join other bands, so there was such a mix and match of musicians. Buffalo Springfield. All of the music was tremendous. Wonderful, wonderful music. And I like Sting, too. Aaron Neville. Queen Latifah. Yeah, I'm pretty eclectic. But the bottom line is...I really appreciate good music that takes me someplace. Oh, I like The Moody Blues. (laughs) There's so many. John Mayall and The Blues Breakers are tremendous. And I have to mention one of the best guitarists ever...Stevie Ray Vaughn, of course. Casey Chambers: Good stuff. Makes me want to pull a record from the crate right now. Thanks for sharing a few of the artists that turn you on. And thanks for sharing a little piece from your wonderfully eclectic career, as well. You always make movies and television better, Mr. Berryman. Thanks again for taking a timeout to speak with me today. We'll be looking for your autobiography. Please let us know when it drops. Michael Berryman: My pleasure. Thank you. And I want to throw a nice shout out to all your readers. And remember next time somebody cuts you off, instead of flipping them off, just realize that...'eh, maybe they're having a bad day.' But, I'll leave you with something my grandmother taught me years ago. "It's good to be lazy. Because it takes 27 muscles to frown and it only takes three to smile." So have a great day, and have a good life. Here's a nice one to add to your collection. Wes Craven's..."The Hills Have Eyes" on Blu-ray in a textured sleeve w/ 40-page booklet, fold-out poster, 6 postcards, loaded w/ bonus features. A really nice package from Arrow Video.